MarketersMEDIA / Newsroom / Developing Travel App to Earn More Profits! Developing Travel App to Earn More Profits! Make your travel business flourish by building powerful travel app that allow your customers to search and book flights, hotels, cars with a full-stacked app. Pune, india - November 9, 2018 /MarketersMedia/ — The process of travel app development is the latest example of advanced technology solutions being adopted by travel businesses. These mobile applications have completely revolutionized the travel sector and are making the concepts of agents completely redundant. With some excellent features and benefits, travel app allow tour companies to offer excellent facilities and other attractive discounts to the users along with wooing prospective customers. Advancements in latest mobile technology and a huge surge in the number of mobile app users in recent times has made it essential for businesses to be active on mobile and other social media platforms. The travel and tourism industry, one of the largest and rapidly growing industries, is no exception. The exponential growth of the travel and tourism industry in the last couple of years is sufficient to indicate its immense potential. Adding to this, mobile technology has further played a huge role in transforming the entire tourism landscape. Approximately 85% of the travelers use smartphones to plan their travel. The 7th most downloaded category of apps among mobile users is travel & tourism. Approximately 30% of the travelers use mobile travel app to find the best deals for hotel and flight. Replacing lengthy guidebooks and confusing maps, both personal and business travel apps have the potential to completely transform the travel experience of the customers around the world. When it comes to a travel app, the importance of GPS location-based services cannot be stressed on enough. In the quest of exploring the unknown, tourists around the world look for quickly find a hotel to check in, a cozy cafe or a nearby attraction to visit. 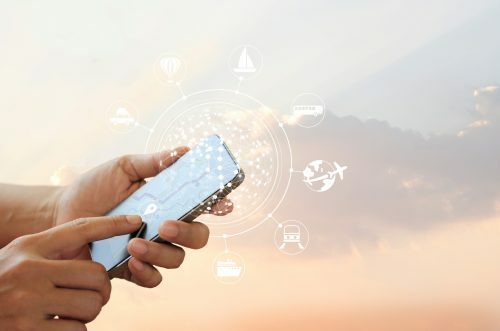 Travel apps with geo-enabled location services that allow the tourists to track the location with quick results are the first preference of customers using such apps. When your customers are on a trip to a different country, currency exchange is one of their main requirements. Instead of looking elsewhere to know exchange rates, your travel app should have the feature of tracking currency rates to let travelers have a smooth experience in a foreign country. Whether you’re on a business trip or a holiday, it is always nice to know about the weather conditions of the place you wish to visit. The weather forecast is an excellent feature to have in any mobile travel app as it adds to the customers’ convenience manifold. To provide the best travel app experience to customers, the travel app must have all the information about local areas along with the city transport guides to help tourists get around the new place easily. If you’re still wondering about the benefits of travel app development for your business, here are three amazing ones that will help you make an informed decision. Business travel apps can be instrumental in allowing you to collaborate with various other service providers for better business prospects. One of the best benefits of using travel apps for businesses is the having the option to book all services in a single place. As the travel partner of your customer, you can make all the arrangements including destination selection, hotel reservation, booking tickets for local attractions at a single place using a good travel app. Unlike the regular mobile websites, travel app offer a dedicated platform to the users. Since the app runs on its own without the need of any browser, it provides a unique experience to your users. The next step after understanding the importance of travel app development is wondering about the costing aspect of your business. Here is everything you need to know about costs. Typically, the cost of developing a travel app depends on a number of assorted factors as listed below. Additional costs such as paid themes added features, etc. With huge benefits, for mobile travel app that have become one of the most important aspects of the travel industry. If you're looking to strategize your business based on customer preferences, having a business travel app can be a real game changer.